Ellen Terry ois Lady Macbeth (1889). 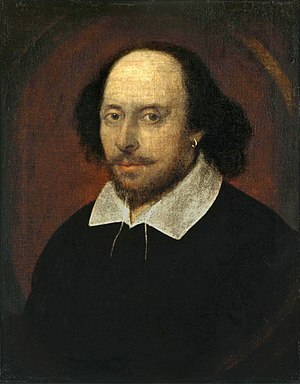 William Shakespeare (1564 - 1616) wor a englischa Dichda, Dramatika und Schauspuija. Ea wead vo vui Leidln ois da gresste Dramatika vo da Wejdliteratur ogsegn. Ea hod z Stratford-upon-Avon, in Warwickshire, England glebt und is emdo gstorm. Seine Stickln wean bis heit gspuid. Da Shakespeare guit aa ois oana vo de gresstn Worteafinda vo da Englischn Sproch. Seit eppa 150 Joa behaptn Laienforscha imma wieda, dass da Shakespeare ned da Urheba vo seim Weak sei kennt. Er warad ja aus da Provinz und hädd koa richdige Buidung ghobt, san de Haptargument. De Wissnschoft is si awa einig, dass da Shakespeare sea woi da Urheba vo nam Weak is. Lua-Fehler in package.lua, Zeile 80: module 'Module:Citation/CS1/Suggestions' not found. BBC News. Bard's 'cursed' tomb is revamped , British Broadcasting Corporation, 28 May 2008. Obgruafa am 23 April 2010. Brooke, Nicholas (1998), "Introduction", in Shakespeare, William; Brooke, Nicholas (ed. 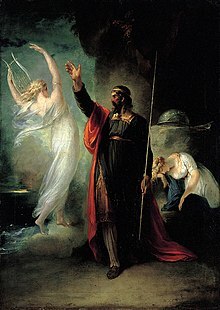 ), The Tragedy of Macbeth, Oxford: Oxford University Press, ISBN 0-19-283417-7 . Burns, Edward (2000), "Introduction", in Shakespeare, William; Burns, Edward (ed. ), King Henry VI, Part 1, London: Arden Shakespeare, Thomson, ISBN 1-903436-43-5 . 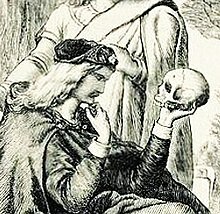 Casey, Charles (Fall 1998), "Was Shakespeare gay? Sonnet 20 and the politics of pedagogy", College Literature 25 (3), archived from the original on 16 Mai 2007, retrieved 2 May 2007 Check date values in: |archivedate= (help). Edwards, Philip; Ewbank, Inga-Stina; Hunter, G. K., eds. (2004), Shakespeare's Styles: Essays in Honour of Kenneth Muir, Cambridge: Cambridge University Press, ISBN 0-521-61694-8 . Hales, John W. (January–June 1904). "London Residences of Shakespeare". The Athenaeum (London: John C. Francis): 401–2. https://archive.org/stream/p1athenaeum1904lond#page/400/mode/2up. Retrieved on 8 December 2013. .
Hattaway, Michael (1990), "Introduction", in Shakespeare, William; Hattaway, Michael (ed. ), The First Part of King Henry VI, Cambridge: Cambridge University Press, ISBN 0-521-29634-X . Hoeniger, F. D. (1963), "Introduction", in Shakespeare, William; Hoeniger, F. D. (ed. ), Pericles, London: Arden Shakespeare, ISBN 0-14-070729-8 . McMullan, Gordon (2000), "Introduction", in Shakespeare, William; McMullan, Gordon (ed. ), King Henry VIII, London: Arden Shakespeare, Thomson, ISBN 1-903436-25-7 . Potter, Lois (1997), "Introduction", in Shakespeare, William; Potter, Lois (ed. ), The Two Noble Kinsmen, London: Arden Shakespeare, Thomson, ISBN 1-904271-18-9 . Rowe, Nicholas (1709), Gray, Terry A., ed., Some Acount of the Life &c. of Mr. William Shakespear, Online at Project Gutenberg (published 1997) |accessdate= requires |url= (help). Royle, Nicholas (2000), "To Be Announced", in Morra, Joanne; Robson, Mark; Smith, Marquard, The Limits of Death: Between Philosophy and Psychoanalysis, Manchester: Manchester University Press, ISBN 0-7190-5751-5 . Shakespeare, William (1914), "Sonnet 18", in Craig, W. J., The Oxford Shakespeare: the Complete Works of William Shakespeare (Bartleby.com (2000) ed. ), Oxford: Oxford University Press, retrieved 22 June 2007 . Taylor, Dennis (2006), "Hardy and Hamlet", in Wilson, Keith, Thomas Hardy Reappraised: Essays in Honour of Michael Millgate, Toronto: University of Toronto Press, ISBN 0-8020-3955-3 . Weake vo William Shakespeare. In: Zeno.org. De Seitn is zletzt am 6. Aprui 2019 um 05:50 gändert worn.